David Quantick (born 14 May 1961, Wortley, South Yorkshire, England) is an Emmy Award winning English journalist, radio and screen writer and critic who specialises in music and comedy. He has collaborated with comics and writers such as Chris Morris and Armando Iannucci (as co-writer for On the Hour, Blue Jam and Veep) and Harry Hill as a writer for TV Burp. 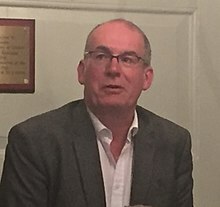 Quantick is a former staff writer for NME, for whom he wrote in the late 1980s and early 1990s, before publishing books such as "How To Write Everything" (2014) and "How to be A Writer" (2016). He was born in Sheffield, adopted, and moved at an early age with his family to Plymouth. Quantick went to Woodford Junior School in Plymouth, then Exmouth Comprehensive School. David Quantick began writing for the music publication NME in 1983, alongside Danny Baker and Paul Morley. Together with Steven Wells, he contributed to many of the humorous snippet sections in the paper. In addition to rock journalism, he was also submitting jokes and sketches to British comedy shows such as Spitting Image. Quantick built his profile steadily and his name began to appear increasingly often in print, radio and television. In 1992, Armando Iannucci asked him to join the writing team for the Radio 4 spoof news programme On the Hour, after which he made the natural progression to the television follow-up The Day Today (BBC2, 1994). He ceased submitting copy to the NME in 1995, and around this time, he was appearing regularly on Collins and Maconie's Hit Parade (Radio 1, 1994–1997), commenting astringently upon music's stars. This developed into his own named slot in the show, named Quantick's World. His connection with Maconie continued in parallel on the weekly show, The Treatment on BBC Radio Five Live, which was an hour-long satirical news round-up. In 1995, Carlton Television broadcast a set of six pilot television shows, one of which was Now What? The series was not picked up for development but Quantick found a writing partner through these proceedings in Jane Bussmann. The two went on to write and perform Bussmann & Quantick Kingsize (1998), a series of sketches and monologues for BBC Radio 4. Quantick rejoined Chris Morris to write for Brass Eye in 1996 (broadcast in 1997). He also wrote for Morris's radio series Blue Jam (Radio 1, 1997) and the subsequent television version Jam (Channel 4, 2000). The 2001 Brass Eye Special attracted so much protest that Government ministers promptly condemned the programme without having seen it. Throughout this period, he also contributed to less provocative fare such as Smack the Pony (Channel 4, 1999–2001), Harry Enfield's Brand Spanking New Show (Sky One, 2000) and could be heard on Radio 4's The 99p Challenge. In 2000, Quantick and Bussmann created the world's first internet sitcom Junkies about three heroin addicts. Quantick also claimed it as the first docusitcom (documentary/sitcom). It starred long-time Morris collaborator Peter Baynham, with Sally Phillips (Smack the Pony) and Peter Serafinowicz (Look Around You). The project grew out of the writing pair's frustration with the commissioning process. The average sitcom, they said, costs £200,000 to make and finding funds is too difficult. So they secured the services of cast and crew on a voluntary basis and made a show for less than £4,000. The site received over a million visits in its first eight months of existence. The following year, he collaborated with Collins and Maconie again on Lloyd Cole Knew My Father, a live show where the three recounted humorous tales of working as rock journalists. Stories were mainly concerned with the deflating aspects of the job, such as the boredom, missing assignments, and the idiosyncrasies of fan letters. A performance was later broadcast on Radio 2 as a six-episode series. In 2003 and 2005, Quantick contributed material to sketch show That Mitchell and Webb Sound, and co-wrote five series of 15 Minute Musical (2004–08) with Richie Webb, whom he also wrote with on several series of Parsons and Naylor's Pull-Out Sections. He also made several appearances on Clive Anderson's radio panel show We've Been Here Before in 2003 and 2004. 2005 also saw him take part in Channel 4's Come Dine with Me, with four other celebrities. Throughout, Quantick worked on biographies of musicians and comedians (The Clash, Beck, Lenny Bruce, Richard Pryor and Bill Hicks). Quantick continues to write, and co-presents a weekly programme One Way Single Parent Family Favourites on art radio station Resonance FM. He was also part of the writing team of Harry Hill's TV Burp, and writes and presents series 3 of 'The Blagger's Guide', a six-part comedy series on BBC Radio 2 with writer and producer Simon Poole. He also appears as Doctor Dave Radio on another Radio 2 comedy programme, Radio Rivron. In 2012, having worked on the final series of TV Burp, Quantick contributed material to The Thick of It, continued to write for Rob Brydon, and recorded further editions of The Blagger's Guide for Radio 2. In September of that year, he published an e-book novel, Sparks, described by Neil Gaiman as "excellent" He produced a four-episode comedy series 52 First Impressions with David Quantick for Radio 4 in 2014 in which he recounted stories about 52 individuals he had encountered in his life/career. He received an Emmy in 2015 for his work on the HBO Series, Veep. That year he crowd-funded a novel The Mule via the Unbound company which was released on 25 February 2016. In addition, he has written two writing manuals for Oberon Books: How To Write Everything in 2015, then How to Be a Writer: Conversations With Writers About Writing the following year. ^ a b c "David Quantick Biography". The Internet Movie Database. Retrieved 15 February 2012. ^ Quantick, David. "Sparks" – via Amazon. ^ "52 First Impressions with David Quantick". BBC Radio 4. 16 October 2014. Retrieved 20 October 2014. ^ "The Mule by David Quantick". Unbound. 4 December 2014. Retrieved 2 April 2016. ^ "That's Because You're A Robot". Image Comics. Retrieved 28 September 2015. ^ "Our First Book – 'Memoirs Of A Shoegazing Gentleman'". Sonic Cathedral. Retrieved 28 September 2015. Collins & Maconie's Hit Parade Audio — SOTCAA — RealAudio clips from the radio series.